Recent research on empathy in humans and other mammals seeks to dissociate emotional and cognitive empathy. These forms, however, remain interconnected in evolution, across species and at the level of neural mechanisms. New data have facilitated the development of empathy models such as the perception–action model (PAM) and mirror-neuron theories. According to the PAM, the emotional states of others are understood through personal, embodied representations that allow empathy and accuracy to increase based on the observer's past experiences. In this Review, we discuss the latest evidence from studies carried out across a wide range of species, including studies on yawn contagion, consolation, aid-giving and contagious physiological affect, and we summarize neuroscientific data on representations related to another's state. Observational and experimental studies dating back to the 1950s demonstrate that mammals spontaneously help distressed conspecifics. Research emphasizes the untrained, unrewarded nature of this behaviour, which is also biased towards familiar individuals, thus arguing against explanations that are exclusively based on associative learning or conditioning. 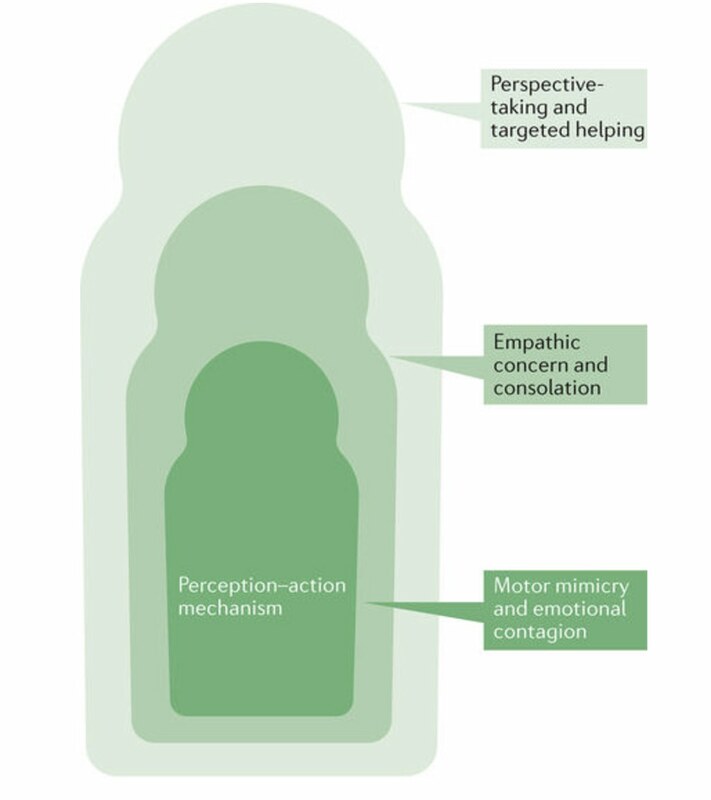 The perception–action model extends an existing motor theory on overlapping representations to emotional phenomena; it states that observers who attend to a target's state understand and 'feel into' it through personal distributed representations of the target, the state and the situation. Easily observed manifestations of this mechanism are emotional contagion and motor mimicry, which have been demonstrated in many animals. In cognitive forms of empathy, the same representations are accessed from the top-down. Experiments on two common mammalian expressions of empathy — the consolation of distressed individuals and spontaneous assistance to those in need — support the crucial role of caught distress and arousal because these behaviours are suppressed by anti-anxiety medication and engage the same neuropeptide system that supports social attachment. The Russian-doll model seeks to arrange forms of empathy into layers that are built on top of each other — with the layers ranging from emotional contagion to more cognitive forms of empathy — in a functionally integrated whole based on perception–action processes. Perspective-taking is well developed in some non-human species, as manifested by theory-of-mind and targeted helping. One can segregate emotional and cognitive empathy (as well as felt and observed states) in the brains of observers, but all forms require some initial access to the observer's distributed, shared, personal representations of the target's state. At least in the initial phase of processing, this access helps to decode the target's state and provide subsequent processing with content and meaning, even if the shared state is not experienced, or is incomplete or inaccurate. Empathic pain does not usually include the peripheral sensation of the target's injury, but it can include sensory information when the stimuli and task instructions emphasize the specific nature of the feeling at the location of the injury.